Roll up, roll up and dive into the delights on offer at The Stand Fete on Saturday 19th May. After a successful first outing last year, The Stand are bringing their village fete back, which promises to be even bigger and better than before. 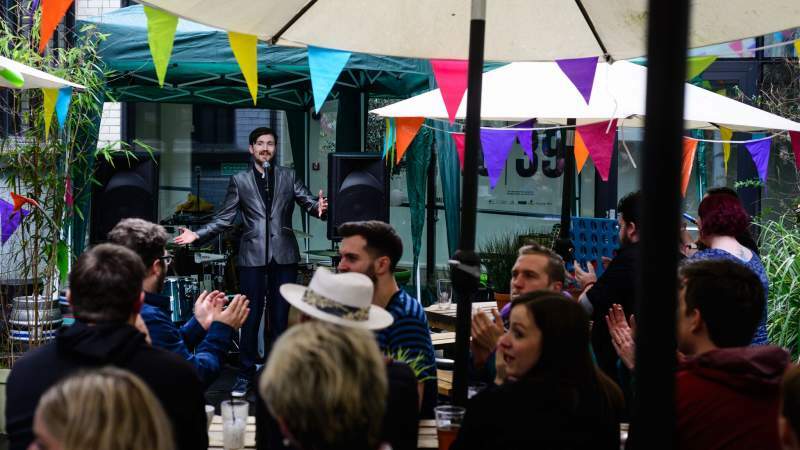 ‘Father’ Joby Mageean is set to host once again, leading the flock in a day of heavenly entertainment including fun, games, local independent traders and even a Firm Handshake Stand. For anyone who thinks their perfect pooch might kill it at Crufts, the Bring Ya Dog Best In Show is searching for an official Stand Dog, who’ll have their photo in the bistro for a whole 12 months. And there’s an equivalent for dads too! If ya da has what it takes, their visage can also adorn the bistro. It wouldn’t be much of a fete without grub, and the return of the Futuristic BBQ is set to take classic food from New York and turn them all Geordie. New York deli stottie anyone? Of course, no day at The Stand would be complete without some good old belly laughs, with Cal Halbert and Gavin Webster on hand to offer up just that, and Lee Kyle will also be making little ones chuckle with a kids show.